As the main event draws near, BCP will profile some of the talented women we'll be keeping an eye on once they "Shuffle up and deal." If Vanessa "The Lady Maverick" Rousso is doing as well in law school as she is on the felt, a Supreme Court future could be within her grasp. 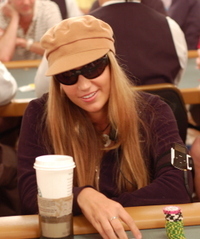 She credits much of her poker success to her undergraduate degree in economics with a strong focus in game theory. I'd have to agree as her investment decisions at the table appear to be spot on. Rousso has already cashed in three 2006 WSOP events so far, including a final table appearance in the $5K Short Handed NLHE event. Her best financial performance was delivered at the WPT Championship Five Star WPC at the Bellagio three months ago, when she scored a 7th place finish and a $263,625 paycheck. Although always appropriately garbed on the tournament floor, she has stated that she would far prefer playing the WSOP main event in her bathrobe. I guess we'll have to wait and see if comfort wins out when she takes the field.